For Reflectorizing any surface that is causing traffic hazard. It can be very effectively used on: Metal beam crash barriers/ Road Dividers / Milestones Median opening / Bridge Railings and any metal, concrete, leather or rubber surface. Surface must be clean, dry and free from any contamination including dust dirt, oil, grease, laitance and curing agents. Particular attention should be given to ensuring the surface is free from salt, ice and moisture. Application is by spray or brush. Reflectomark shall be thoroughly mixed before use. Never pour onto the surface. The prepared surface must be covered with 120 micro film thickness of well stirred Reflectomark coating system. It is always advisable to try a test area before proceeding with the main application. 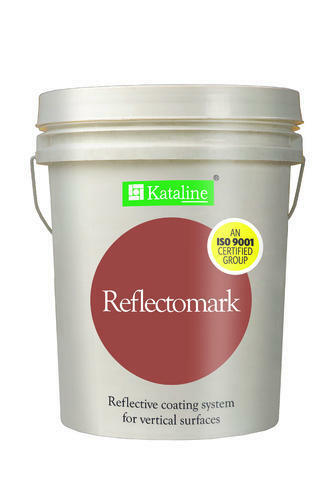 Reflectomark is supplied in 500 ml. and 1 litre. packs store in cool, dry, well ventilated place. Shelf life is 6 months under normal conditions. Retlectomark contains flammable solvents. Keep away from source of ignition. Kataline as a vision was seen with exemplary clarity in the year 1999. Years that have passed by have seen the company grow step by step in the dynamic arena of infrastructure while contributing in incomparable measure towards road safety. From just being a road marking contractor, the company has diversified into the production of road marking materials, equipments and also traffic signages. Kataline has earned a remarkable reputation in trustworthiness, all because of a strong customer focused approach and the continuous quest world class quality which has enabled it to attain and sustain leadership in its chosen line of business and it continues to leave its foot prints through the nation and beyond.